A public workshop on Genome Assembly and Annotation from October 10-12, 2018. 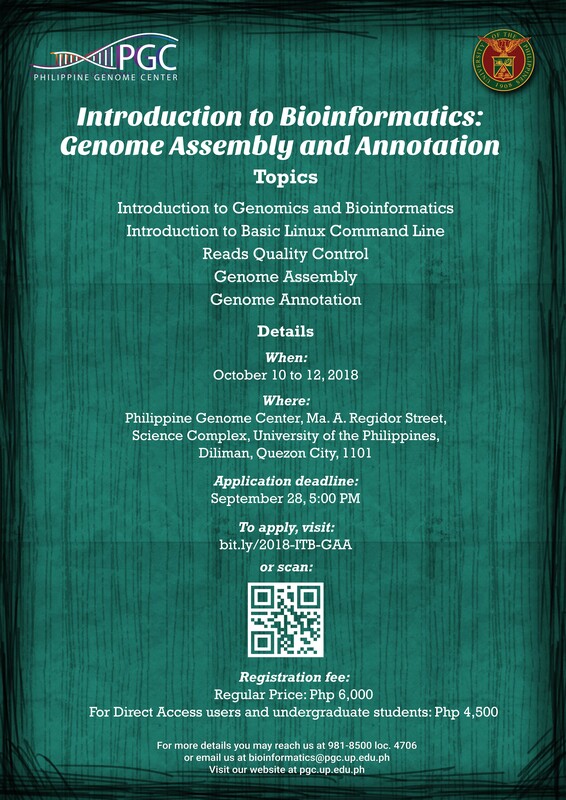 The Core Facility for Bioinformatics (CFB) is conducting a workshop titled “Introduction to Bioinformatics: Genome Assembly and Annotation” on October 10 to 12, 2018 at the PGC bldg. A. Ma. Regidor St. National Science Complex, UP Diliman, Quezon City, 1101. This workshop and training aims to provide a step-by-step, detailed and easy to follow hands-on workshop on basic NGS data processing. The workshop will cover basic concepts, applications, and workflows that address typical genomics-based problems. This training and workshop event is open to students and researchers (biologists, computer scientists, statisticians, etc.) who are exploring the use of genomics in their studies, or who wish to expand their knowledge-base with the recent advances and techniques in genomics and bioinformatics. Limited slots are available for this workshop. Interested applicants may fill out the form below (Application deadline: Sept. 28, 2018, 5:00pm), and will be selected based on qualifications and need. Accepted attendees will be informed by October 5, 2018. Registration fee is Php6,000, and includes training kit, meals (AM snack, lunch, PM snack), and training certificate. Php4,500 for Direct Access users and undergraduate students. Payment options may be found here. Reminder: Please do not settle your payment until your slot has been confirmed.